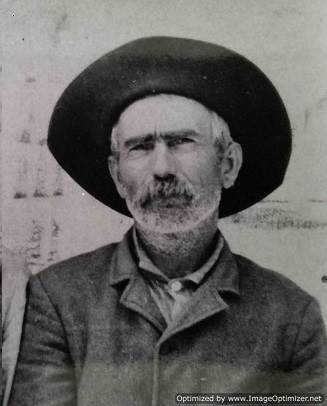 William Brumley my great-great uncle, known to most people as Bill. He was born on March 11, 1847, in a small town called Richland in Gasconade County, Missouri. He was the first child born to Willis Brumley and Mary (Polly) Johns. His other siblings were; Nancy Ann, Amanda Elizabeth, and John Brumley. His half siblings were by Nancy J Vaughan-Loughery-Lewis and Willis; Alice Florence and Isaac Walter Brumley. At the age of twenty-five, he married Mary E Williams on October 24, 1872, in Maries County, Missouri. In the Missouri Census of 1880, it has William living with R B Williams his mother-in-law and it lists Mary as dead. When my mother and I visited two newly found relatives in southern Missouri in the 1980's they told us that his wife and two children were involved in a house fire that killed her and two children. We could never prove that this took place but we know she is buried in Kenner Cemetery in Hayden, Maries, Missouri. I don't know if the children were buried with her or if they were in separate unmarked graves. Bill picked up the pieces of his life after the loss of his first family and started to move forward once again. On July 6, 1881, in Maries County, Missouri he married his second wife, Mrs. Ellen Illinois Bell Lenox Blackwell. They had one daughter, America Layna, born December 3, 1882. My mother and I heard many stories about Bill. One, in particular, was the time he had too much to drink and relied on his faithful horse to see to it he made it home all in one piece. He was known to be a character when he drank too much but that is the fun part of learning about your relatives doing family genealogy. He and his wife remained in the Dry Creek area of Maries County until the time of his death. Bill died on May 7, 1917, of Chronic Intestinal Nephritis at the age of seventy years old. He was buried in the Kenner Cemetery in Hayden, Missouri with his first wife Mary and his father Willis Brumley. My mother, Nancy Gertrude Brumley, myself and two other cousins walked this cemetery in mid-1980. We have at least eleven members of the family tree in this cemetery. Some of the tombstones are very old and you can hardly read what was engraved, others have nothing but white stones indicating a grave. 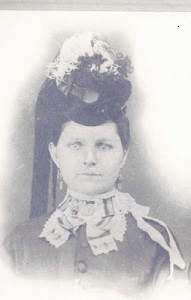 Nancy Elizabeth Baugh was my great-great-grandmother and was proven to be a strong woman all of her life. Nancy was born to John Henry Baugh and Sarah Elizabeth Higgenbotham in January 1828 in North Carolina. Her known siblings are Mary Ann 1819, John C 1825 and Samuel Valentine Baugh 1833. It is not known when her family began to move westward to settle in the Lincoln County, Missouri area but it was before 1846. 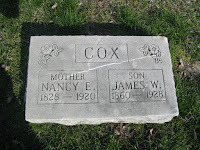 She meant her future husband Ralph H C Cox when she was eighteen years old and they were married on December 15, 1846, in St. Charles County, Missouri. They started their family in 1848 when Sarah Elizabeth was born. 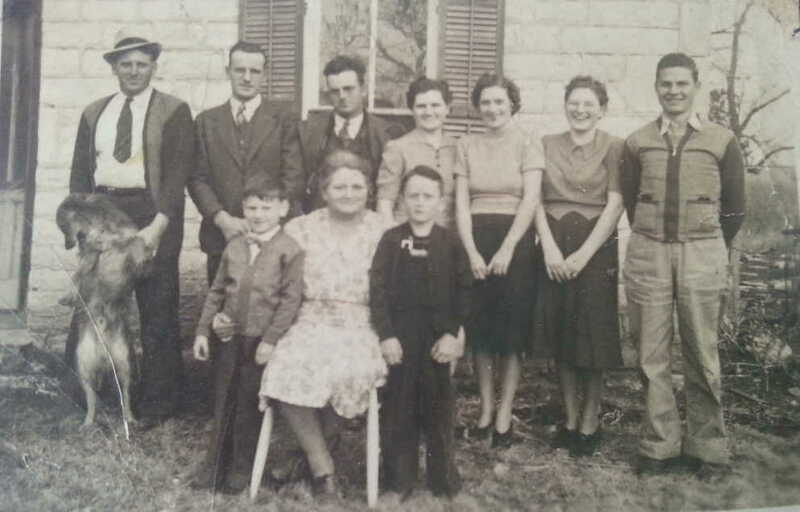 Siblings that followed were; Thomas Henry, Sophia Jane, Jesse, Mary Ellen, James William, Ralph Henry, Anna Perlina and Nancy Katherine Cox (my great-grandmother). 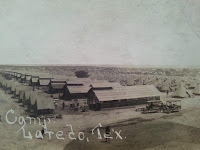 They lived in Bedford, Lincoln, Missouri from 1848 until sometime between 1870 and 1880. The 1880 Missouri Census shows them residing in Miller, Maries, Missouri. 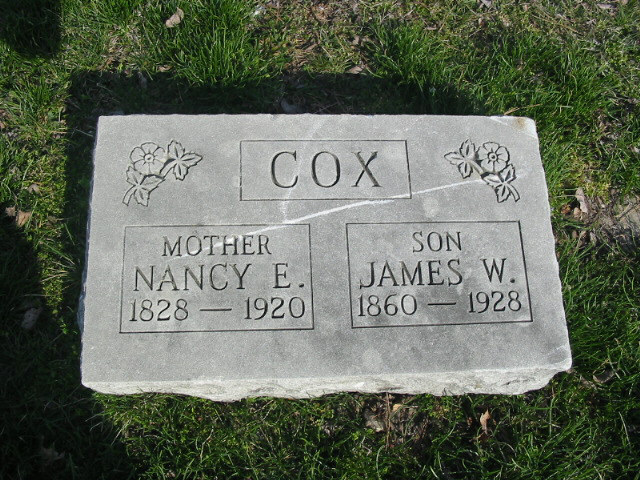 In 1896 their son James William Cox married Nancy Clementine Laney. They had two girls before 1900, Nancy Elizabeth "Bessie" and Sarah Evaline Cox. On October 26, 1896, at the young age of 29 Clementine "Tina" died of brain fever. A horrible and tragic death. This left James with two very small children to raise by himself. Nancy and Ralph took on the challenge of helping James raise his two small girls so James could keep on working. The 1900 Census showed that Nancy and Ralph were still living in Miller. On July 16, 1907, Ralph at the age of eighty-five died and they were living in Dixon, Pulaski County, Missouri. Nancy was 79 years old and now a widow. She never remarried. In the 1910 Census, it shows she was eighty-two living in Pulaski County with the girls now 13 and 15. Sometime between the 1910 and 1920 Census, she was living with James as she was ninety-two years old in Baxter Springs, Cherokee, Kansas. James was taking care of her now because she had helped raise his girls. Nancy Elizabeth Baugh Cox died sometime in 1920 and is buried in Galena, Cherokee, Kansas next to her son James William Cox. 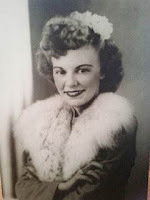 She outlived most of her family and was a giving mother who always knew the most important thing to her was her family. Several years ago I corresponded with a daughter of one of the girls in the above picture. She said her mother shared countless stories of the dedication Nancy showed her family. I hope somehow all of the relatives got some of her DNA because she was a remarkably strong woman. Katie became ill either in 1912 or before and whatever her symptoms they were bad enough that someone had to admit her into the hospital. The informant on the certificate doesn’t know some of the basic information. So the person who admitted Katie was probably not a relative or Walter. She was diagnosed with Pellagra, a horrible disease back in the day. Pellagra is caused by a lack of Niacin or Vitamin B-3 and has symptoms of dementia, diarrhea, and dermatitis, and if left untreated can lead to death. The mystery surrounding her death has been a long-standing question for years as my mother and I have looked for her gravesite with no luck. Two unknown relatives that we discovered in the early 1980's did not even want to discuss it with us as we were gathering genealogy information. All they told us was where she was at, at the time of her death. Mental illness was not talked about in the last century as it is today. People did not want other people to know they had someone in their family with mental illness. My mother and I had to convince our two cousins, Effie and Edna that it was alright to talk about this with us. So even back in the 1980’s, it was still a taboo subject with the elderly relatives living in the Ozark area. He was born on November 26, 1895, in Dixon, Pulaski, Missouri. He was the first son born to Isaac Walter Brumley and Katherine (Katie) Cox. His other siblings were William Ralph, Thomas Clinton, Nancy Beatrice, Henry Elmer and Walter Willis Brumley. 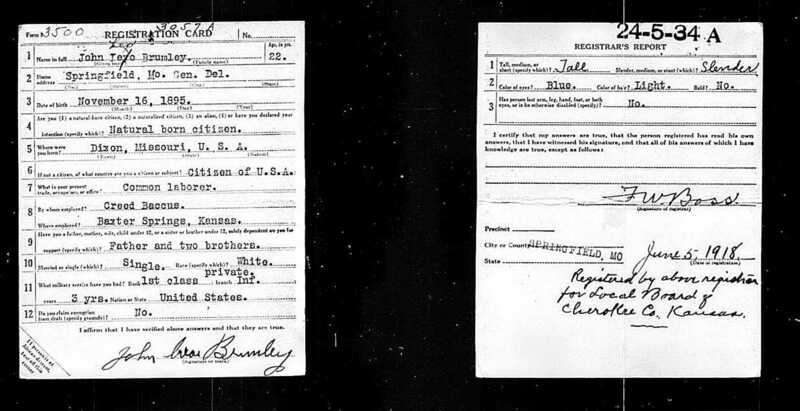 John was only sixteen years old, when his mother, Katherine Cox Brumley died of Pellagra in 1912. This left his father, Isaac Walter with five children to take care of and raise. 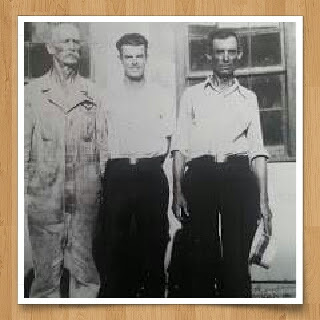 John, William, and Thomas were old enough to seek employment to help the family’s finances. Nancy also decided to take out on her own as well, but Henry and Walter were left with other families so their father could go to work with the railroad to earn a living. 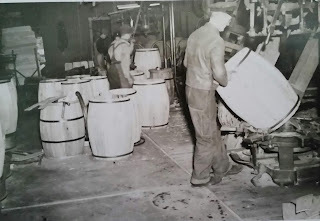 My grandfather was a union carpenter by trade and worked on several projects in Kansas City, Wyandotte, Kansas. The Great Depression of the 1930's came along work drastically slowed down and eventually no jobs were available. My mother told me the stories how he would have to go downtown and stand in "the bread line" for any food he could get for his family. My mother and her siblings grew up in various neighborhoods in Kansas City, Kansas, and my grandparents lived the remainder of their lives there. My mother told me stories about the Strawberry Hill community where people came from Croatia, Ireland, Germany and many other countries to live and thrive. They all got along because they all had the common thread of living and working in the United States to better themselves and their families. John once again had to enlist in another war, this time it was WWII. 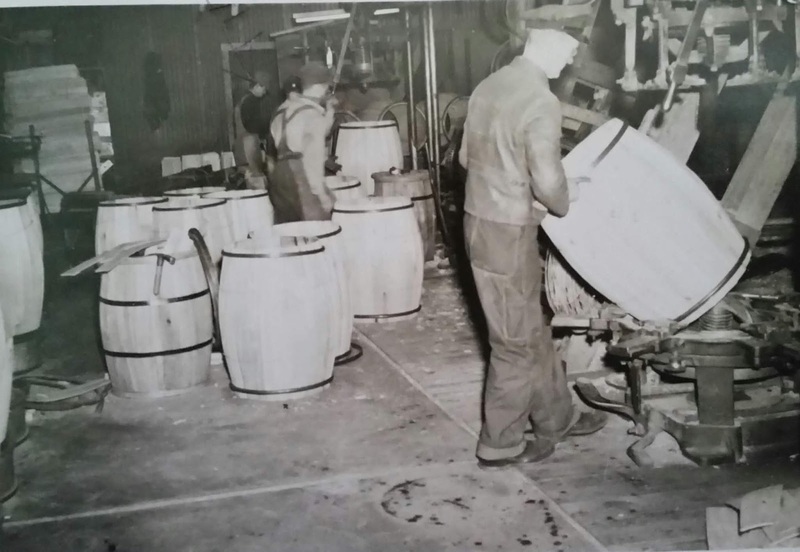 He did not serve in that war because of his age and his disabilities from working as a carpenter. 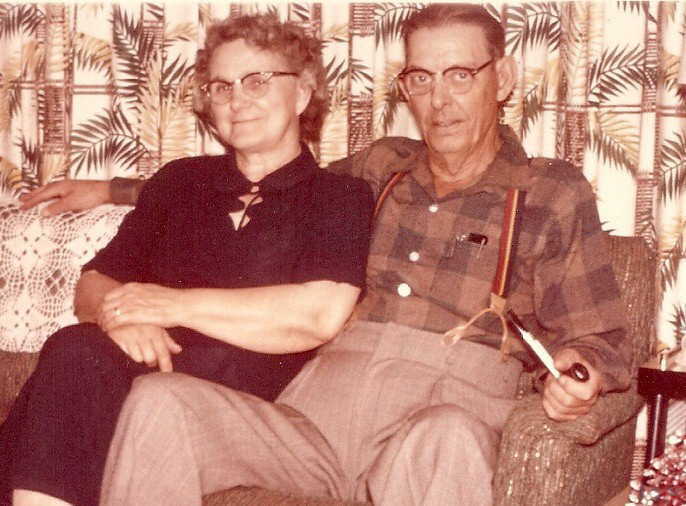 My grandmother, Nellie Opal Sells Brumley died in 1965 and John lived in the city until his health began to fail. He then moved to Olathe, Johnson, Kansas to a nursing home, where he could be closer to his children that were caring for him. John Leo Brumley died May 29, 1976, at the age of eighty years old. They are both buried at Highland Cemetery in Kansas City, Kansas. I have started my blog up again and have updates on my favorite posts. If you enjoyed reading this please pass this along to family and friends. 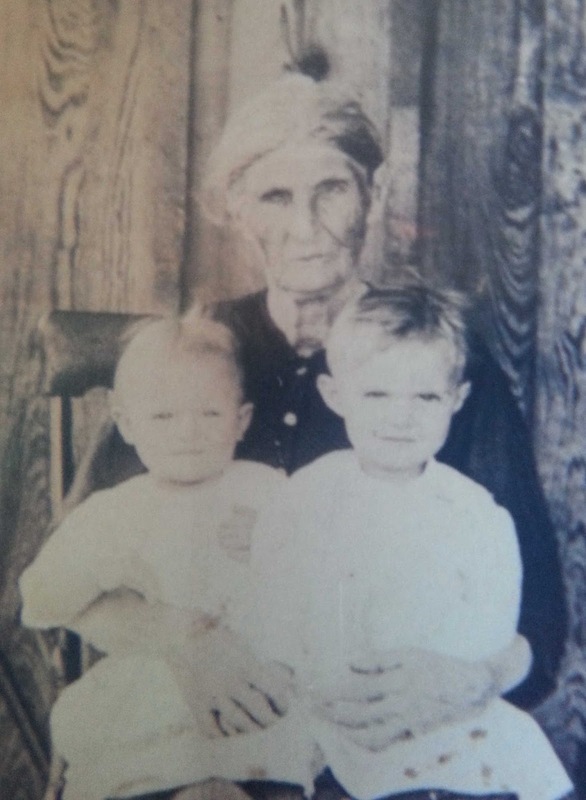 Gertrude Wilburn Nichols was my great-grandmother. She was born to Simon Nichols and Sarah Frances Douglas in Union, Clark, Missouri on May 17, 1878. Her siblings by Sarah were Lorena R, Lilly F, Addie, Robert Lee and Simon Leonard Sells. She also had half-brothers and half-sisters because her father had been married before to Mary Frances Noel. They were William Ruben, John Clayton, Nancy, Mary A, Alvira Ellen and Emma E Nichols. Gertrude lost her little sister Addie when she was about 3 years old of some unknown illness at that time they were living in Union, Clark, Missouri. At the time of her father’s death, she was living in Williamstown, Lewis, Missouri. By 1884 the family was living in Kahoka Clark County and at the age of 16 years old, she married my great-grandfather Columbus Sells of the same county on November 15, 1894. Gertrude and Columbus started their family by having a son, John Wesley Sells on February 10, 1896, in Kahoka. The family had moved once again to Farmington, Iowa when my grandmother, Nellie Opal was born in 1900. They had their last child, Sylvia Pearl Sells in Ft. Madison, Lee, Iowa on February 28, 1902. For years my mother and I have wondered what Gertrude's middle name was, it was always just a "W" for the middle initial. Since I have learned about her young son's passing and his name, I now know that it stood for Wilburn. On the 1910 Missouri Census Columbus and Gertrude and their family were living in Union, Laclede, Missouri. They moved again sometime between 1910 and 1920 to Springfield, Greene, Missouri. Gertrude developed pneumonia and died on November 6, 1919, she was only forty-one years old and was buried in Springfield. 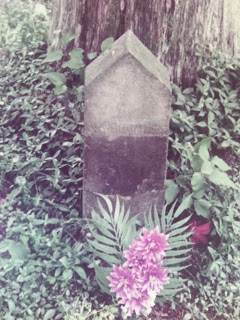 Gertrude never had a proper headstone so my aunt, Shirley Ann Brumley Stevens purchased one for her gravesite in Springfield, Green, Missouri, and had the grave properly marked. As I have written about before, Gertrude and her family were 7th Day Adventist. The early Adventist Church emerged from a climate of religious revival in the Northeastern United States. 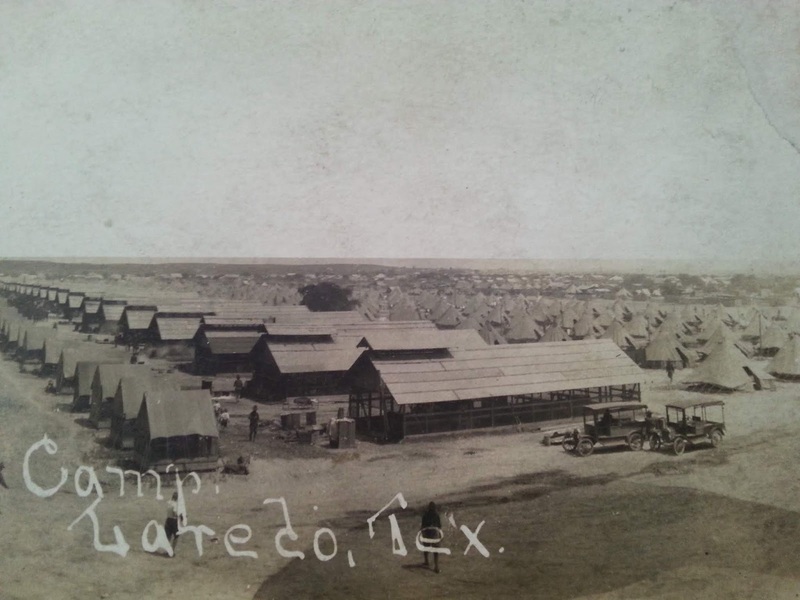 Camp meetings, such as the Millerite gathering, were a hallmark of the Second Great Awakening. Gertrude continued her faith into her own marriage to Columbus and brought the children up as 7th Day Adventist. I have started up my blog again and I am posting my favorites with the updates I have learned since the last one. If you enjoyed this blog please share with family and friends. 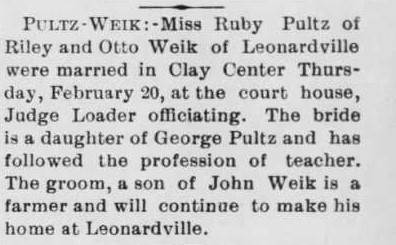 Ruby Jemima Pultz Weik was my paternal grandmother and as I was growing up we called her Grammy Weik. 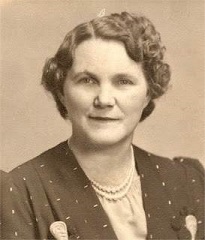 She was born on September 14, 1889, in Woodburn, Clark, Iowa to Edward George Pultz and Kate Anna Smith. Ruby was their fifth child out of thirteen children. 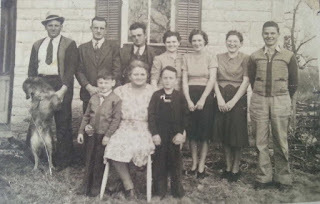 Ruby's brothers and sisters were George Alvah, Frank, Ina Grace, Carrie Rosalie, Edward Glenn, James Harold, Waunita Susan, Edna B, Lloyd Wilson, Williard Zee, Kenneth Leo and Wilma Jean Pultz. She and some of her siblings were raised in Iowa until they moved to Kansas around 1899 to Bala, Riley, Kansas. The rest of her siblings were born in Kansas where they settled in and around the area for their childhood. Her father came to Kansas as a farmer with many mouths to feed. They all pitched in and did their share of the chores every day to keep the farm running smoothly. One by one the children left to find their own paths on the journey of life. My grandmother was no different and at the age of eighteen, she meant and fell in love with a young man that would become my grandfather, Otto Richard Weik. On February 20, 1908, at the Clay County, Kansas courthouse. 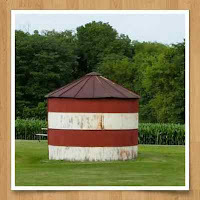 Otto lived in the nearby town of Leonardville, Riley, Kansas and it was there they made their home as he continued to farm the land. They soon started a family with seven children, Leo John, Edward Hugh, Don Charles, Lola Mae, Elsie Elizabeth, Ina Marie and Merle Otto Weik, my father. Tragically sometime in the Spring of 1926, he was working around horses when one of them kicked him injuring him severely. On June 16, 1926, he died of his injuries. He was only forty-one years old. He was buried at the Sunset Cemetery in Manhattan, this would leave Ruby with seven children to raise as well as running a farm. She relied on the knowledge she had learned as a child on how to work as a family together to keep the farm producing food for themselves as well as income for the family. My father Merle was only three years old when his father died and while his brothers and sisters along with Ruby worked out in the field they would put him in the wagon as they worked so they could keep an eye on him. They raised much of their own food. As the older boys grew older they began to leave home to pursue jobs other than farming. Once again, Ruby made it work until the children were grown and then it was time to move to the city. Ruby never remarried and was devoted to her family. Between 1925 and 1930 she moved to Manhattan, Riley, Kansas. In 1940 the census shows she was living in Blue, Pottawatomie, Kansas just outside of Manhattan. She eventually went back to Manhattan to live out her life. I remember summers when I was a child that we traveled to Manhattan to visit her along with other relatives, she was always willing to tell us a story of how it was back then when she was a child. Her health started to fail and on June 3, 1973, she died at the age of eighty-three years old. She was buried at Sunset Cemetery next to her beloved husband Otto. My father was devoted to her as she had been to him during those years when he had no father. He told me that it was his older brothers that stepped up to guide him, especially his brother Edward. 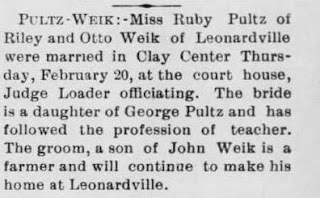 I am starting my blog back up again and would enjoy hearing from any relatives that would have anything to add about Ruby Jemima Pultz Weik. If you enjoyed this post, I would be grateful if you would spread the word by emailing it to a friend. Thank you very much.